CROWN JEWELS The collective term Crown Jewels denotes the regalia and vestments worn by the sovereign of the United Kingdom during the coronation ceremony and at other state functions. 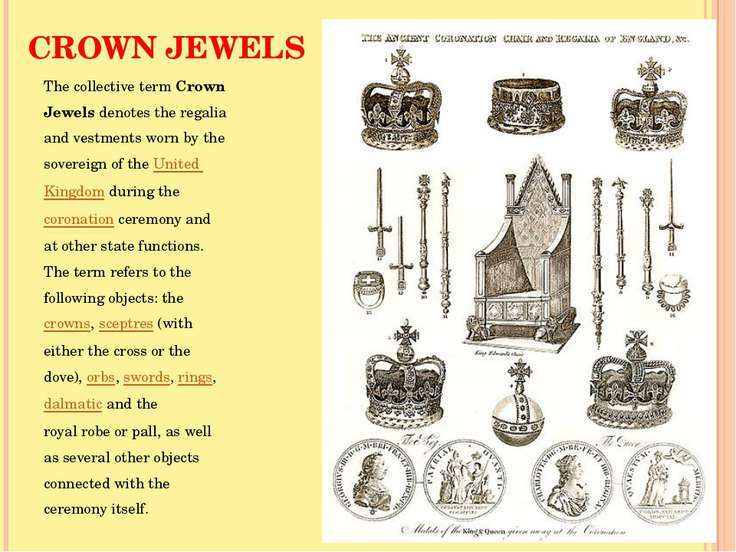 The term refers to the following objects: the crowns, sceptres (with either the cross or the dove), orbs, swords, rings, dalmatic and the royal robe or pall, as well as several other objects connected with the ceremony itself. 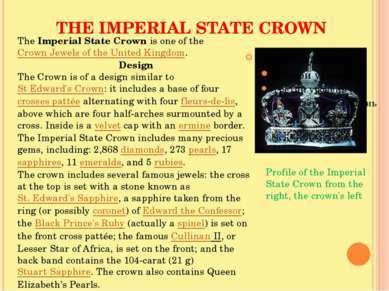 THE IMPERIAL STATE CROWN Profile of the Imperial State Crown from the right, the crown's left The Imperial State Crown is one of the Crown Jewels of the United Kingdom. 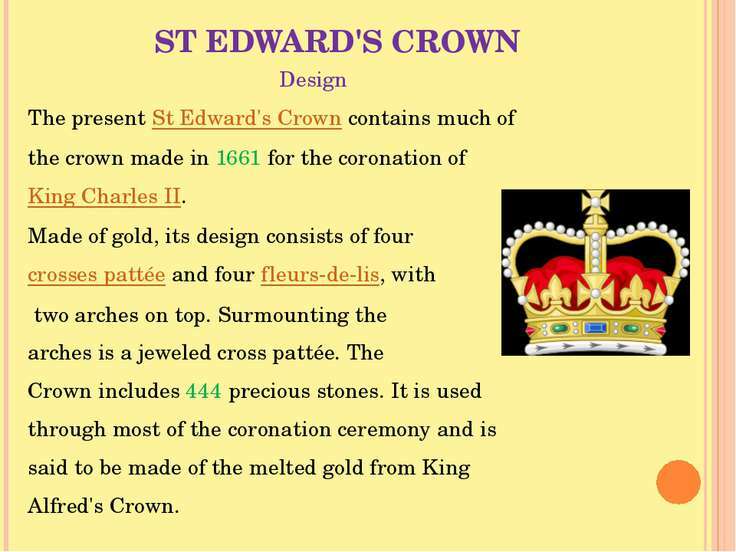 Design The Crown is of a design similar to St Edward's Crown: it includes a base of four crosses pattée alternating with four fleurs-de-lis, above which are four half-arches surmounted by a cross. Inside is a velvet cap with an ermine border. 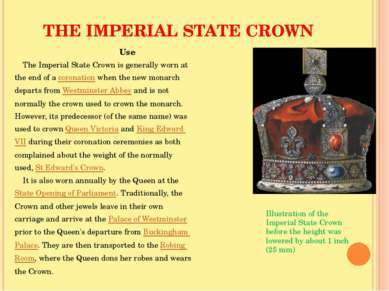 The Imperial State Crown includes many precious gems, including: 2,868 diamonds, 273 pearls, 17 sapphires, 11 emeralds, and 5 rubies. 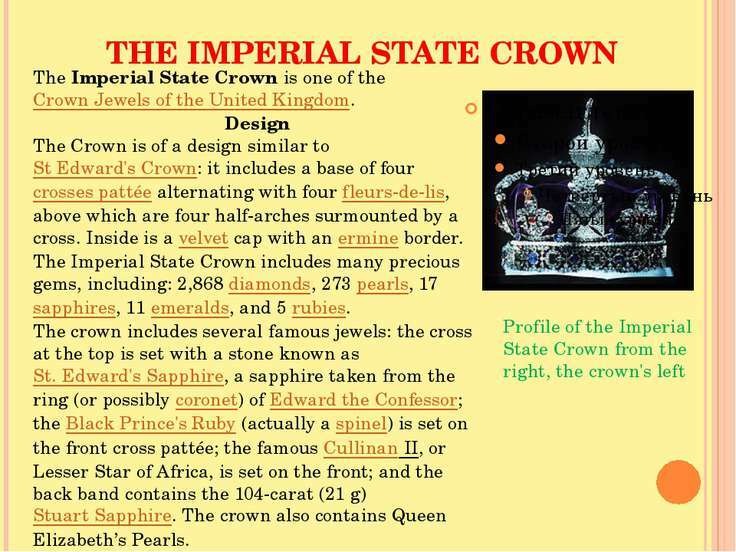 The crown includes several famous jewels: the cross at the top is set with a stone known as St. Edward's Sapphire, a sapphire taken from the ring (or possibly coronet) of Edward the Confessor; the Black Prince's Ruby (actually a spinel) is set on the front cross pattée; the famous Cullinan II, or Lesser Star of Africa, is set on the front; and the back band contains the 104-carat (21 g) Stuart Sapphire. The crown also contains Queen Elizabeth’s Pearls. The Crown is 31.5 cm high and weighs 0.91 kg. 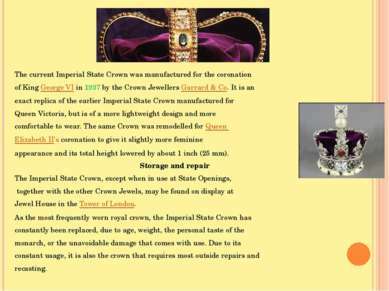 The current Imperial State Crown was manufactured for the coronation of King George VI in 1937 by the Crown Jewellers Garrard & Co. 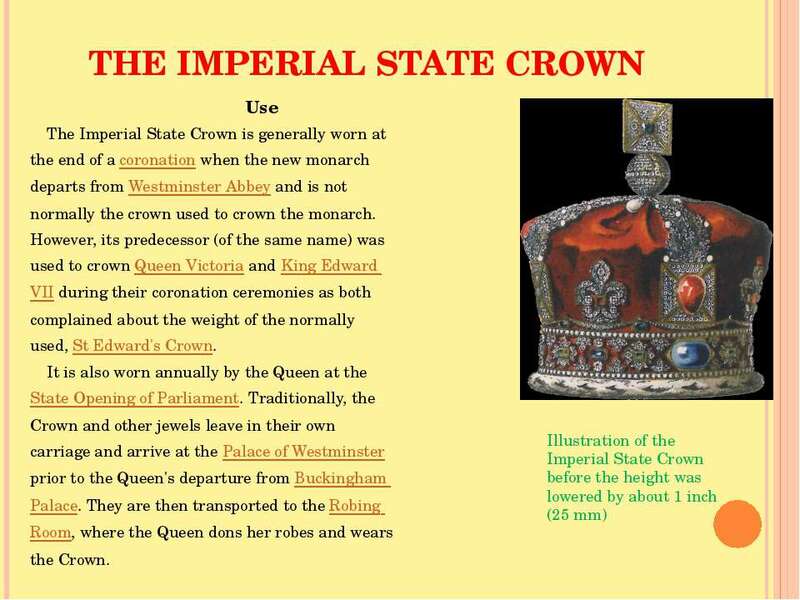 It is an exact replica of the earlier Imperial State Crown manufactured for Queen Victoria, but is of a more lightweight design and more comfortable to wear. 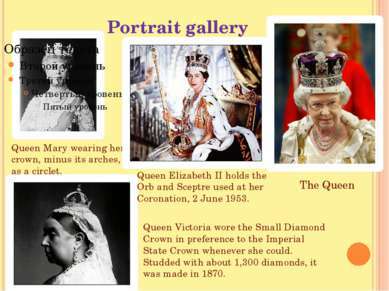 The same Crown was remodelled for Queen Elizabeth II's coronation to give it slightly more feminine appearance and its total height lowered by about 1 inch (25 mm). Storage and repair The Imperial State Crown, except when in use at State Openings, together with the other Crown Jewels, may be found on display at Jewel House in the Tower of London. 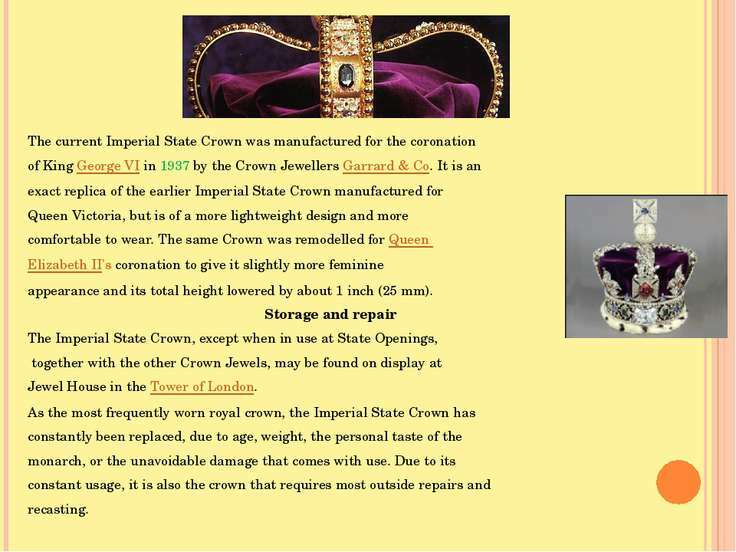 As the most frequently worn royal crown, the Imperial State Crown has constantly been replaced, due to age, weight, the personal taste of the monarch, or the unavoidable damage that comes with use. 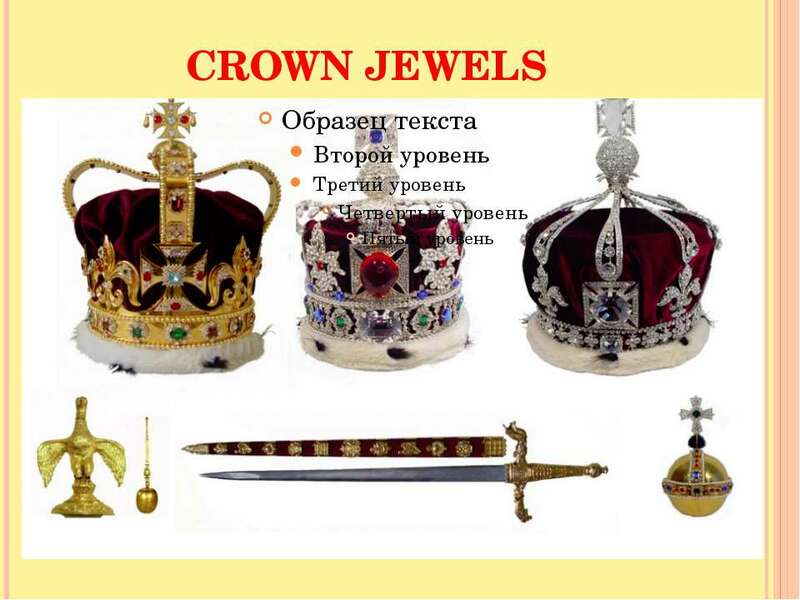 Due to its constant usage, it is also the crown that requires most outside repairs and recasting. 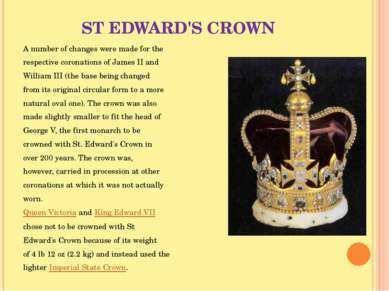 ST EDWARD'S CROWN St Edward's Crown was one of the English Crown Jewels and remains one of the senior British Crown Jewels, being the official coronation crown used in the coronation of first English, then British, and finally Commonwealth realms monarchs. As such, two-dimensional representations of the crown are used in coats of arms, badges, and various other insignia throughout the Commonwealth realms to indicate the authority of the reigning sovereign. ST EDWARD'S CROWN Design The present St Edward's Crown contains much of the crown made in 1661 for the coronation of King Charles II. Made of gold, its design consists of four crosses pattée and four fleurs-de-lis, with two arches on top. Surmounting the arches is a jeweled cross pattée. The Crown includes 444 precious stones. It is used through most of the coronation ceremony and is said to be made of the melted gold from King Alfred's Crown. ST EDWARD'S CROWN Use Although always regarded as the "official" coronation crown, in fact only a minority of monarchs have actually been crowned with St. Edward's Crown. 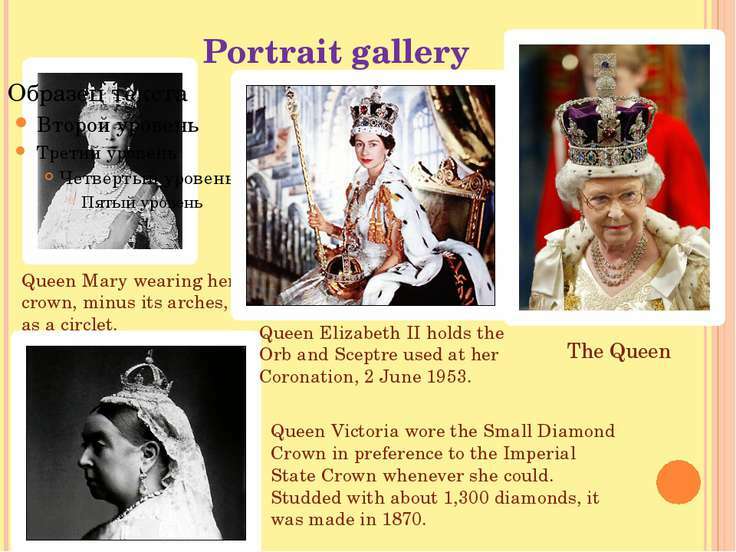 These were Charles II (1661), James II (1685), William III (1689), George V (1911), George VI (1937) and Elizabeth II (1952). ST EDWARD'S CROWN A number of changes were made for the respective coronations of James II and William III (the base being changed from its original circular form to a more natural oval one). 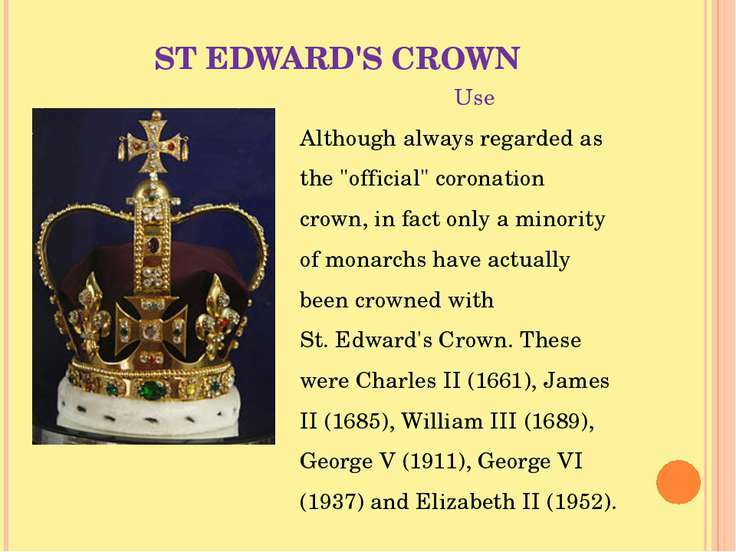 The crown was also made slightly smaller to fit the head of George V, the first monarch to be crowned with St. Edward's Crown in over 200 years. The crown was, however, carried in procession at other coronations at which it was not actually worn. Queen Victoria and King Edward VII chose not to be crowned with St Edward's Crown because of its weight of 4 lb 12 oz (2.2 kg) and instead used the lighter Imperial State Crown. 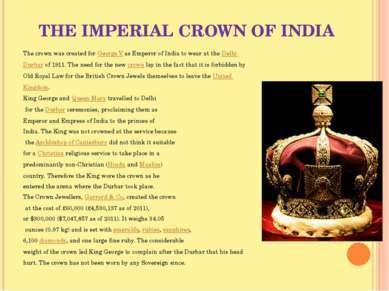 THE IMPERIAL CROWN OF INDIA The crown was created for George V as Emperor of India to wear at the Delhi Durbar of 1911. The need for the new crown lay in the fact that it is forbidden by Old Royal Law for the British Crown Jewels themselves to leave the United Kingdom. King George and Queen Mary travelled to Delhi for the Durbar ceremonies, proclaiming them as Emperor and Empress of India to the princes of India. The King was not crowned at the service because the Archbishop of Canterbury did not think it suitable for a Christian religious service to take place in a predominantly non-Christian (Hindu and Muslim) country. Therefore the King wore the crown as he entered the arena where the Durbar took place. 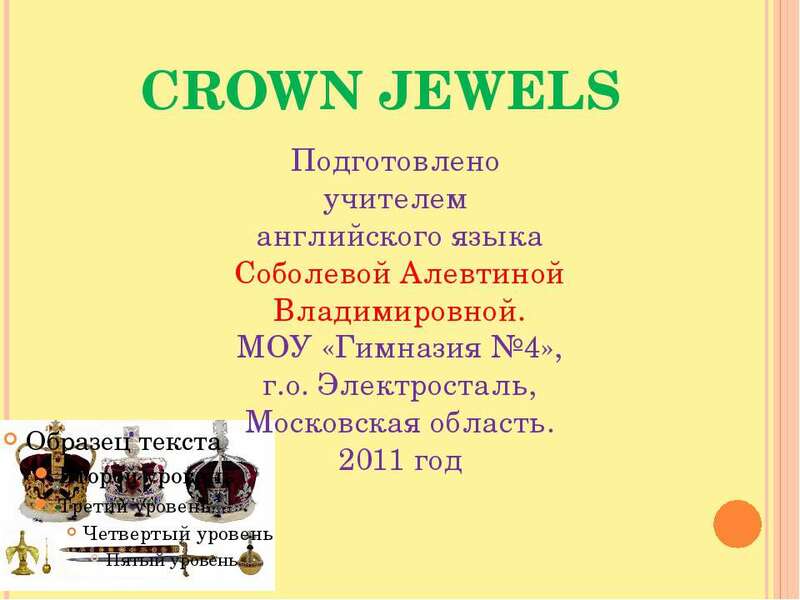 The Crown Jewellers, Garrard & Co, created the crown at the cost of £60,000 (£4,530,137 as of 2011), or $300,000 ($7,047,857 as of 2011). 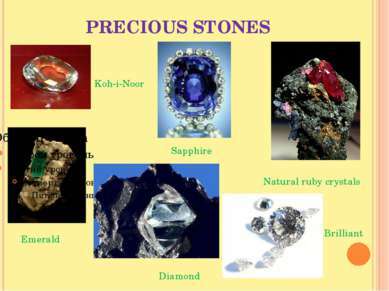 It weighs 34.05 ounces (0.97 kg) and is set with emeralds, rubies, sapphires, 6,100 diamonds, and one large fine ruby. The considerable weight of the crown led King George to complain after the Durbar that his head hurt. 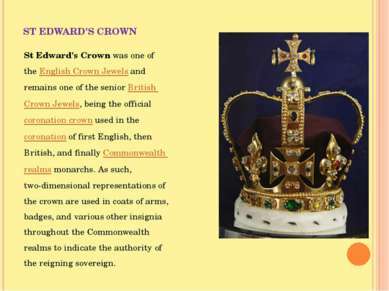 The crown has not been worn by any Sovereign since. 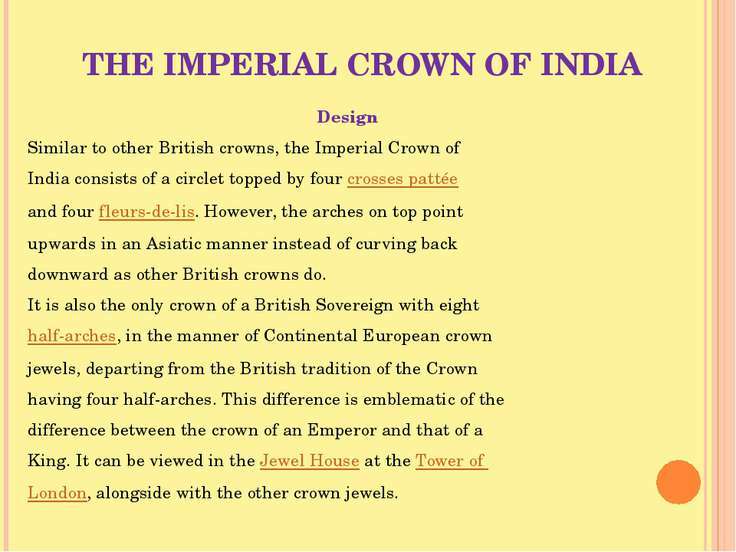 THE IMPERIAL CROWN OF INDIA Design Similar to other British crowns, the Imperial Crown of India consists of a circlet topped by four crosses pattée and four fleurs-de-lis. 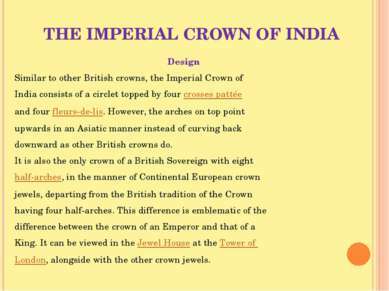 However, the arches on top point upwards in an Asiatic manner instead of curving back downward as other British crowns do. It is also the only crown of a British Sovereign with eight half-arches, in the manner of Continental European crown jewels, departing from the British tradition of the Crown having four half-arches. 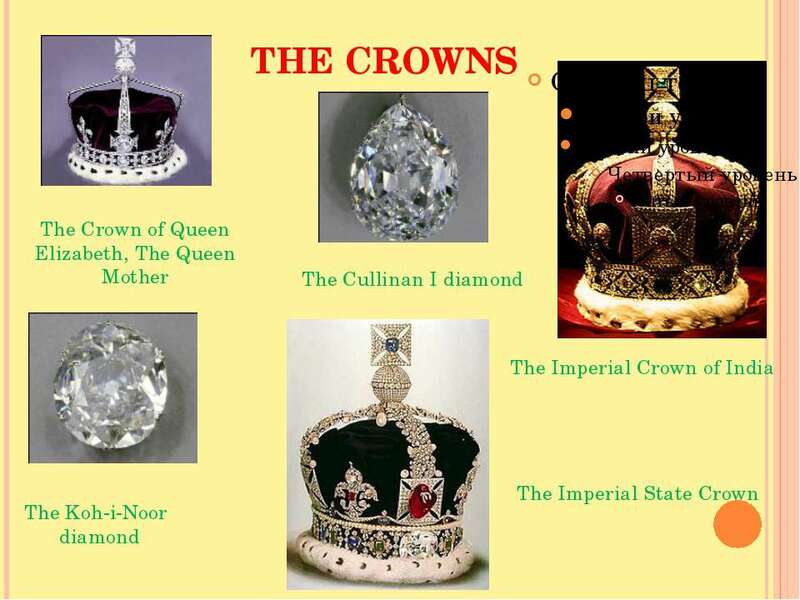 This difference is emblematic of the difference between the crown of an Emperor and that of a King. It can be viewed in the Jewel House at the Tower of London, alongside with the other crown jewels. THE CROWN OF QUEEN ELIZABETH, THE QUEEN MOTHER One of the most impressive of the crowns on display at the Tower of London is the crown made for Queen Elizabeth, the Queen Mother. 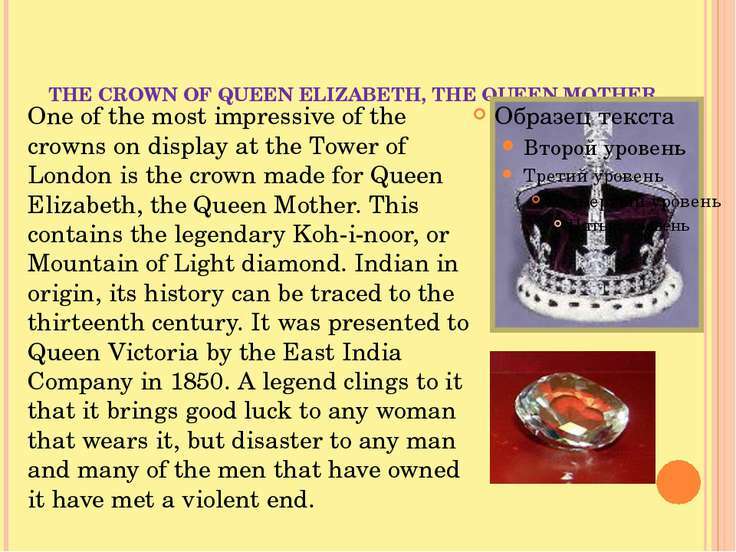 This contains the legendary Koh-i-noor, or Mountain of Light diamond. Indian in origin, its history can be traced to the thirteenth century. It was presented to Queen Victoria by the East India Company in 1850. A legend clings to it that it brings good luck to any woman that wears it, but disaster to any man and many of the men that have owned it have met a violent end. 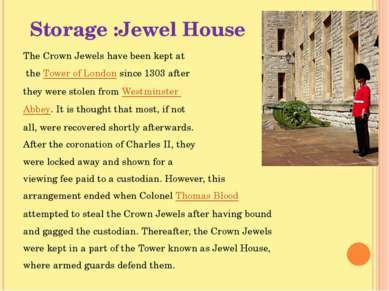 Storage :Jewel House The Crown Jewels have been kept at the Tower of London since 1303 after they were stolen from Westminster Abbey. It is thought that most, if not all, were recovered shortly afterwards. After the coronation of Charles II, they were locked away and shown for a viewing fee paid to a custodian. However, this arrangement ended when Colonel Thomas Blood attempted to steal the Crown Jewels after having bound and gagged the custodian. Thereafter, the Crown Jewels were kept in a part of the Tower known as Jewel House, where armed guards defend them. THE ORB Among many of the other Crown Jewels is the Orb. The Orb is a golden globe that is used during the coronation ceremony to symbolize the world ruled by Christianity. It dates to 1661 for the coronation of Charles II. This gold Orb is lined with many pearls and contains a jeweled cross that is topped off with pearls as well. 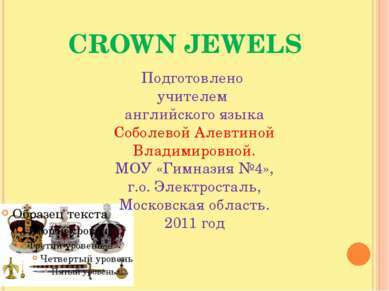 It is held in the monarch's left hand during the coronation ceremony. 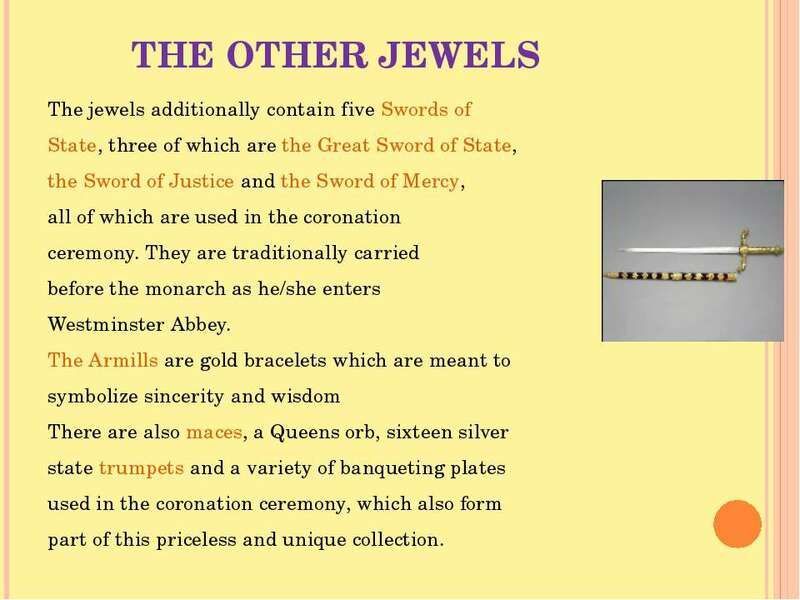 The jeweled cross which surmounts the orb reflects the monarch's title of Defender of the Faith. 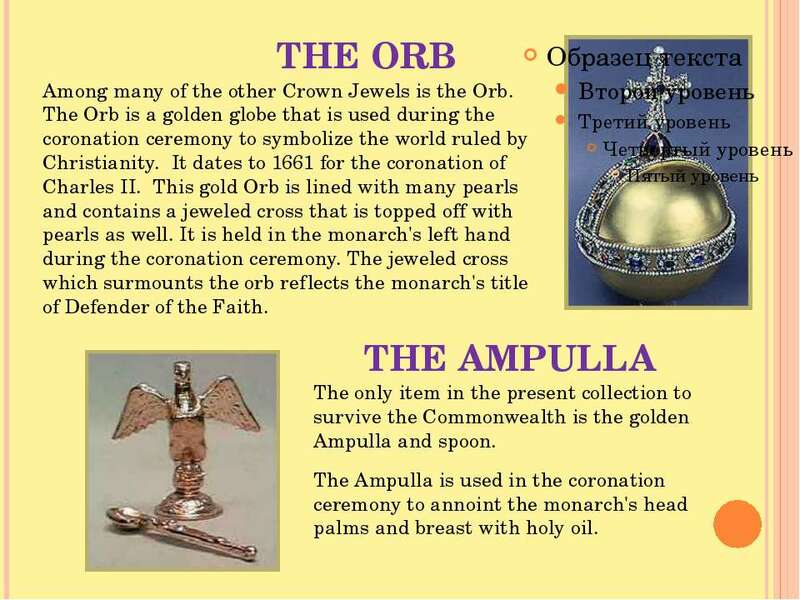 The Ampulla is used in the coronation ceremony to annoint the monarch's head palms and breast with holy oil. 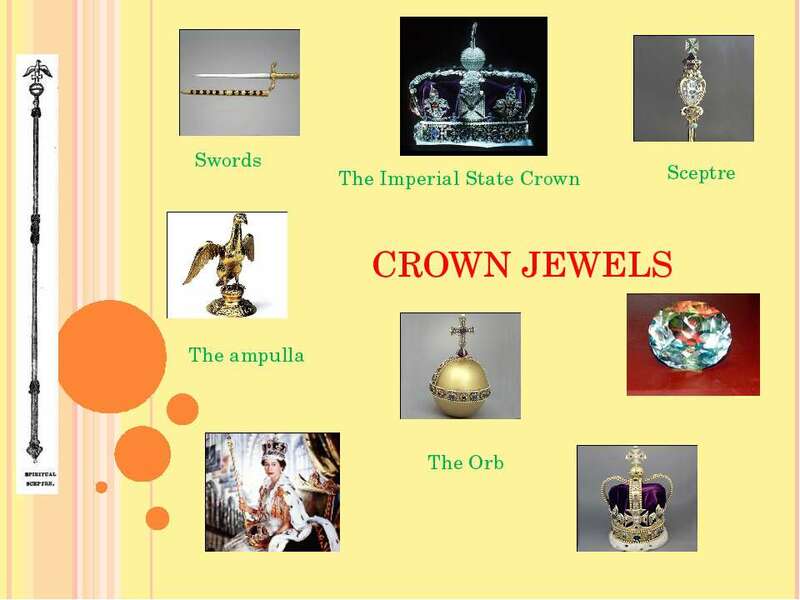 THE AMPULLA The only item in the present collection to survive the Commonwealth is the golden Ampulla and spoon. 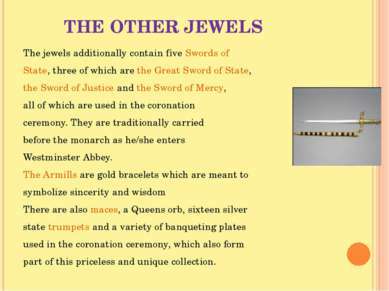 THE OTHER JEWELS The jewels additionally contain five Swords of State, three of which are the Great Sword of State, the Sword of Justice and the Sword of Mercy, all of which are used in the coronation ceremony. They are traditionally carried before the monarch as he/she enters Westminster Abbey. The Armills are gold bracelets which are meant to symbolize sincerity and wisdom There are also maces, a Queens orb, sixteen silver state trumpets and a variety of banqueting plates used in the coronation ceremony, which also form part of this priceless and unique collection.